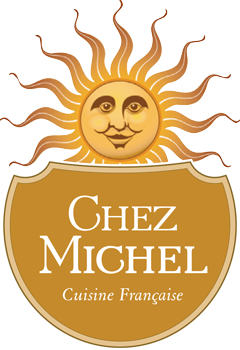 Nestled in a century building on the picturesque main street of Creemore, Ontario, Chez Michel is a French country restaurant that prides itself on exquisite food and excellent customer service. Decorated in the bright colours of Provence and comfortably cozy on a candlelit evening, the restaurant is a personal reﬂection of its proprietors, Michel and Elinor Masselin. Michel’s expertise is in the kitchen; Elinor’s is in assembling a knowledgeable and courteous staff to ensure your evening will be enjoyable. Whether enjoying the ambience of the restaurant’s main room, relaxing in the more intimate wine bar or dining en pleine air on the charming patio, guests will be thrilled by Chez Michel’s classic French Cuisine, delectable desserts and extensive selection of ﬁne wine. Lunch at Chez Michel is an experience worth savouring. Join us for lunch and linger over a delectable dessert. Our lunch menu features authentic French Cuisine with locally sourced ingredients. Chez Michel offers authentic French Cuisine with ingredients sourced locally. Always fresh and seasonally focused, you will delight in our artful dinner creations with expert wine pairings. Prix Fixe available nightly.